Terrific Deal - You get TWO Modules for ONE price! These modules are clean pulls from equipment, they have been used. They are in good shape but may have a smudge or two. I sell lots of these modules on eBay and everybody loves them! They feature an industry standard Optrex-Compatible 14-pin interface (uses the Hitachi HD44780 driver chip) so they are easy to drop into almost any electronics project. Using these modules is easy and fun! They operate on 5-Volts DC and and are very "battery-friendly" ;) They also have a built-in Electro-Luminescent backlight (requires ~90-120 Volts AC [see note below]) for smooth, even lighting (No "hot-spots" like you get with LED backlights!) 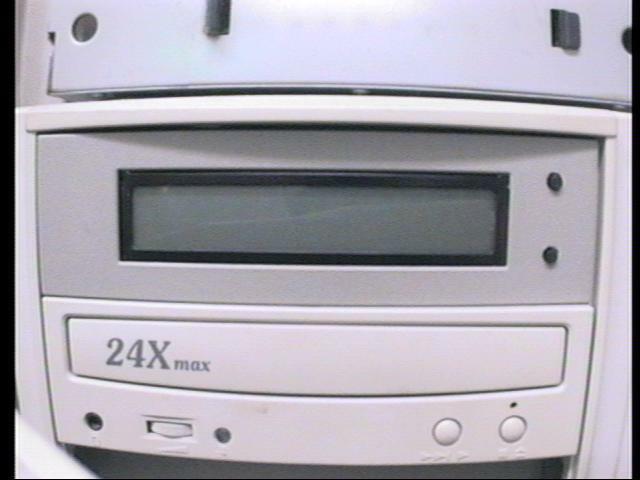 They are great for use in Robotics, MP3 Players, PC Status Displays, or any other project that needs a spiffy display. Here are some links to more information: wm-c2402p.pdf and hd44780u.pdf. You will probably also be interested in these excellent articles: lcd1.pdf and lcd2.pdf which are chock-full of useful information, circuit examples, sample code and other interesting stuff. If you want to operate them from a regular PC parallel port... you can! You will need to make a custom cable however to hook it up and be prepared to write some simple software to send data to the module. 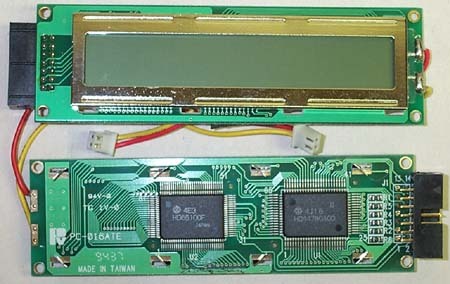 Here is a link to a site with more information on doing this: How to Hook Up an LCD Module to a PC Parallel Port. What you will receive: We have a number of these modules and they come in several minor variations but are all basically the same. The module depicted in the photo is for illustration purposes only. The actual modules you receive may be slightly different but guaranteed to work as presented. The only notable difference between the modules is that most of them have a 14-pin male-header for connection, while the rest have a short "pig-tail" cable (approx. 8" in length) terminating in a 14-pin female connector. Unless you specify otherwise, you will get "dealer's choice". However, if you really want one or the other, just remind us when you send in your payment and we'll make sure that you get the ones that you want. These modules are guaranteed to work! We test them all before we ship them but if by chance, you somehow get a dud, just return it to us and we'll send you another one. Note: Please be careful hooking up the backlight. Don't use ordinary house-current for this. While it will work, it is not the smartest idea because if you accidently get zapped, mains power can supply enough current to make it hurt (or even kill you!) Be smart- be safe, use a switching-type circuit that is designed for this purpose instead- or at the very least, a large wattage resistor and an inline fuse.